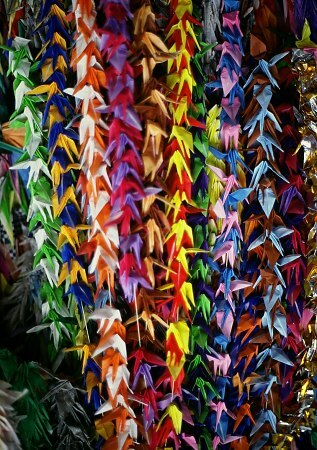 One of the most impresive sights in Hiroshima are the innumerable brightly coloured paper cranes at the Children’s Peace monument. I was told that the origami cranes had become a powerful peace symbol because of the story of a little Japanese girl who developed leukemia 10 years after the nuclear bomb had been dropped. She had begun to fold 1000 origami cranes but died before she could complete her task. Others continued for her and there are thousands and thousands of new cranes every year.